If I could write what my heart truly felt, the internet police would block our page! For the life of me I just can’t think what would make someone do this to a poor defenseless baby or for that fact, to any living creature. ​​We have named this lil' guy Koda because he looks like a little brown bear. 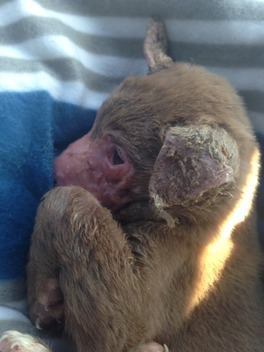 Some low life psycho set this baby on fire and then dumped him on the sidewalk in front of a local business. He has second and third degree burns to his face, ears, feet, tail, and one thigh. He can hardly open his mouth due to the swelling and the pain. By the grace of God it appears that his eye sight was spared. 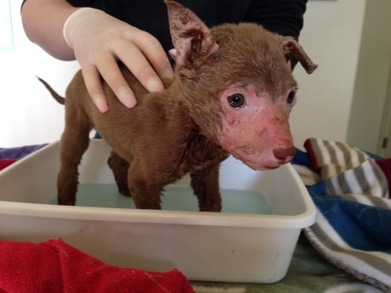 A burn victim’s worse enemy is infection, so he will be our “little pup in a bubble” for some time. As with any burn victim, the treatment is painful and the healing process long. 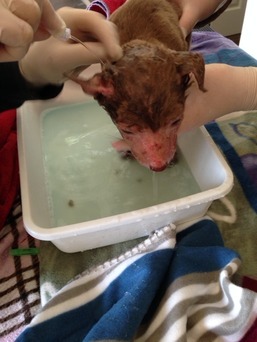 ​​He started his long road to recovery today with his first debriding bath to clean away dead tissue and loose fur, to make sure all open areas are clean and to rehydrate the tissue. He did have “puppy morphine” to help ease the pain. 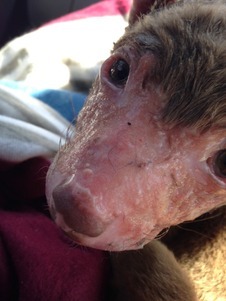 Burns are usually dressed with sterile gauze but because 90% of his burns are on his face they can’t be dressed. To protect the burns on his feet and to prevent him from scratching his face he will be wearing baby socks for a while. We were given a special gel to apply to his face that will help to prevent infection and help keep the skin moist. He is on IV fluids, two different antibiotics, pain medication, and an anti-inflammatory to help with the swelling from the burns. 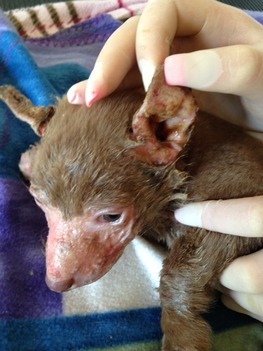 ​​His teeth say he is about 6-7 weeks old but with the burns to the face and the pain he is having difficulty opening his mouth to eat regular wet food or small kibble. After trying several things, we hit pay dirt -- Mom to Mom Chicken baby food, hooray! 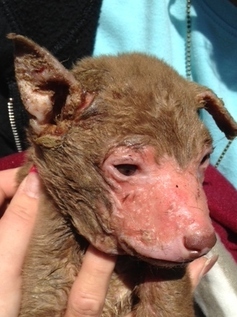 Before anyone asks….we don’t know what breed he is because of the fur loss, swelling to the face and the distortion the burns have caused but hopefully he will heal and his fur will return and his true identity will be revealed. Please keep Koda in your prayers. He has many months of recovery and we will keep you updated.